Michael Schumacher is one of the most successful Formula One drivers ever, with seven world champions to his name. The German courted his fair share of criticism alongside his success, but he holds many of F1's driver records. After a long and successful career with Ferrari, Schumacher retired in 2006, before a comeback with Mercedes in 2010. After one podium, he retired a second time at the end of 2012. In late December 2013, Schumacher suffered a serious head injury after a skiing accident. Michael Schumacher made his way to Formula One through the traditional route of karting, national single seater competitions and then took a sidestep towards sportscars. He joined the Jordan F1 team to make his debut partway through the 1991 season, deputising for another driver. After one race in Belgium, he moved to Benetton for the rest of the season disappointing Eddie Jordan who had hoped to sign the young German. In only his second season in Formula One, his first full year of racing, Schumacher was in contention for the title, but finished second at the end of the season. In 1994, he had snapped up his first championship, with a second consecutive title following in 1995. Schumacher left Benetton and joined Ferrari in 1996, forming a successful group around him of Rory Byrne and Ross Brawn, alongside team boss Jean Todt. Schumacher quickly started winning races, but couldn't put together a successful championship campaign until 2000, following it up with four more to make five consecutive titles and seven altogether. Amongst the success were several questionable actions, including team orders that favoured Schumacher over the driver in the second car - notably at Austria in 2002 with Rubens Barrichello. The German racer was also accused of crashing into his competitors deliberately, particularly when a championship was at stake. In Monaco, 2006, Schumacher had his pole position taken away as the stewards judged he had parked up on track to stop any other drivers beating his time. By then, however, the performance of Ferrari had dropped off and Schumacher was thinking about retirement. He confirmed his departure from the sport at the end of the season, becoming a consultant for the team for 2007. When Ferrari driver Felipe Massa was injured during the 2009 season, Schumacher began training to fill in for him but had to withdraw due to an injured neck. The close call whet his appetite for racing again, however, and he looked for another opportunity to rejoin F1. In 2010, he joined the Mercedes team, alongside old friend Ross Brawn. The comeback was much anticipated but somewhat muted in the end. 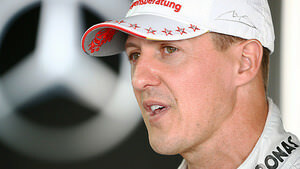 After just one podium finish over three seasons, Schumacher confirmed he would retire for a second time. On 29th December 2013, Schumacher suffered a severe head injury after a skiing accident in France. He remained in hospital for eight months, returning home in early September 2014. Updates on his condition have been few and far between, however, with the latest update that he has a "long road to recovery." 27/04/2017 The Great Debates - Can you compare F1 eras? 25/04/2016 Has Rosberg turned the corner with his early dominance? Grid position can be crucial at this track, as all but two of the race winners have started on or alongside pole position. The only two drivers to achieve a victory from further back were Michael Schumacher and Fernando Alonso, and neither were more than fifth on the grid. Question 3: Which team did Michael Schumacher make his F1 debut with for one race only? Pole position last year was Michael Schumacher in the Mercedes with a 1:14.301. He was given a penalty after that, but shows the Mercedes like this circuit... in the dry. Michael Schumacher starts his last race before his second (and probably last!) retirement. He didn't have a great qualifying, 13th on the grid, but there's talk of a wet setup for the Mercedes.